It took until the nearly the last day I was in Paris, but a local resident who understand my values absolutely insisted I check out La Bellevilloise, and so I did that night. It turned out to be what I would consider the place I’d hang out at the most in Paris, a true third place for creatives. On a Saturday night, La Halle Aux Oliviers, Le Club and Cafe-Terrasse (see diagram below) were all open and completely full, with Le Club featuring a live band, and La Halle live individual musicians (see photo above). As you can see, La Halle is unlike any dining experience you’ve been to lately. The Terrasse, an outdoor terrace, was ideal for more quiet conversations. Most surprisingly is that the food and drinks were priced noticeably lower than the Parisian average – they truly understood the creative lifestyle. On the second floor, Le Forum provides a more formal, elegant performance space, and the third floor provides two high-definition screening areas to allow artists to advance their video work. 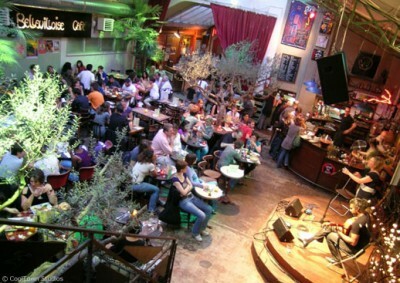 The events are considered among the most cutting edge in Paris, from exhibitions, concerts, shows and DJ sets to festivals, markets, soirees and screenings. Great post about one of my fave places to hang out in Paris ! I am glad I brought you there and that plans are starting to emerge to bring your place crowdsourcing methods to my city. wish you the very best and let’s talk soon ! Love this, I’ve gotta visit.